The Golden Tech Maxi Comforter Lift Chair offers a tasteful contemporary look that's at home with any furniture style. The proud product of American craftsmanship, the Maxi-Comfort Series of Chairs features unmatched safety of chaise lounge padding on every model, the revolutionary comfort of the famous Morley Torsioned Spring system, and the unsurpassed protection of the Golden Lifetime warranty. 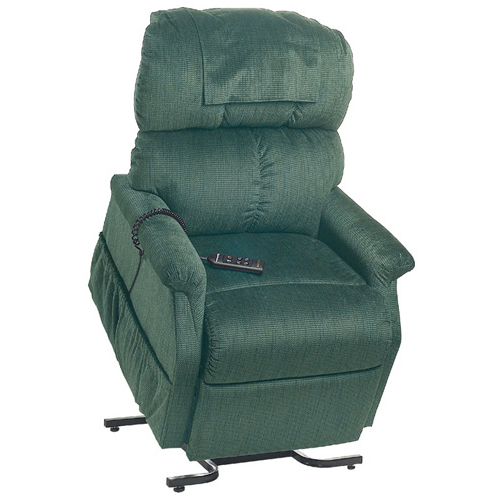 These Infinite position recliners are equipped to give you years of comfort and durability. Full chaise lounge padding provides luxurious comfort from head to foot. Not only does this feature give unmatched comfort, but also works as a safety feature by eliminating the space between the end of the seat and the top of the footrest. Warranty of Electrical Parts: 3 Yrs.